I must remember next time that Val Pierce’s bootees are “huge”. 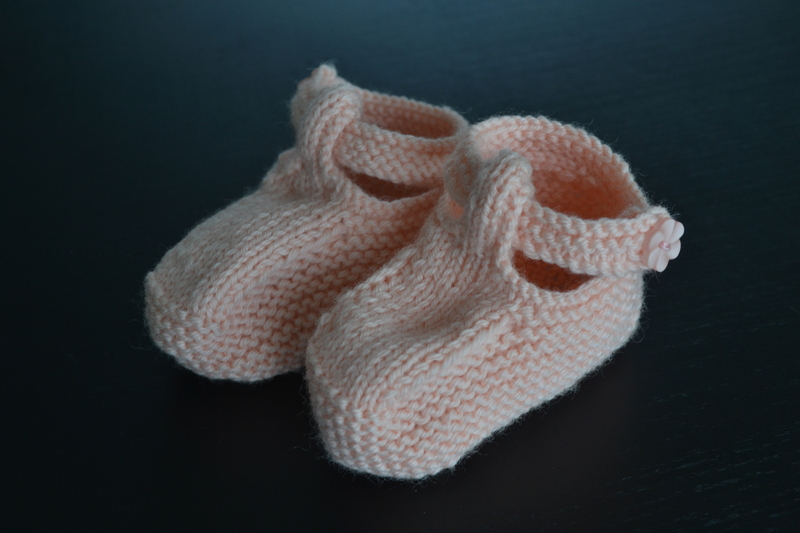 If I knit bootees, it is usually for a newborn and these are definitely not a newborn size. Her patterns are one size only so next time I will use a finer wool to see if that helps. 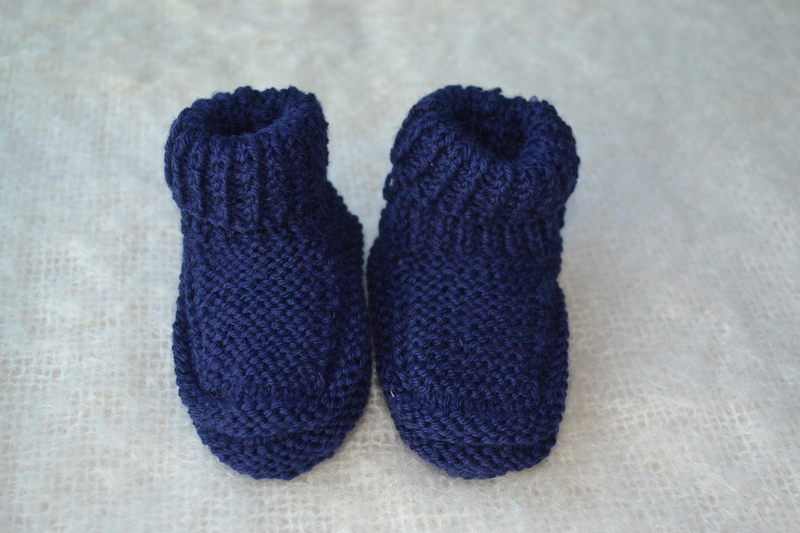 When Sebastian was first born, I made baby him a tiny pair of Hooties bootees and these rather large blue ones from my Val Pierce bootee book. I can only hope that Sebastian got some wear out of them before the cold days turned into summer. 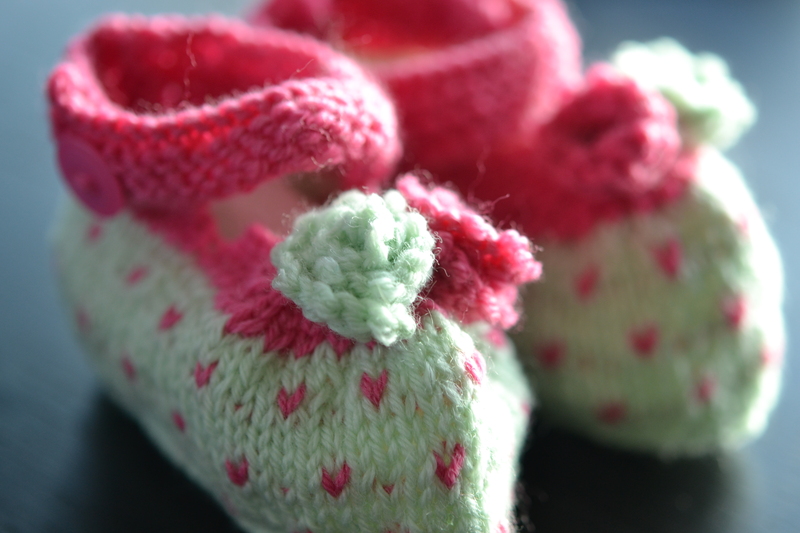 But then again, I am not sure if they are a very good pattern as they don’t have anything to hold them onto baby’s feet. I think next time I make bootees I won’t let my girls have such a wide selection of patterns to choose from. I think I will select only bootees patterns that look like they will stay on. 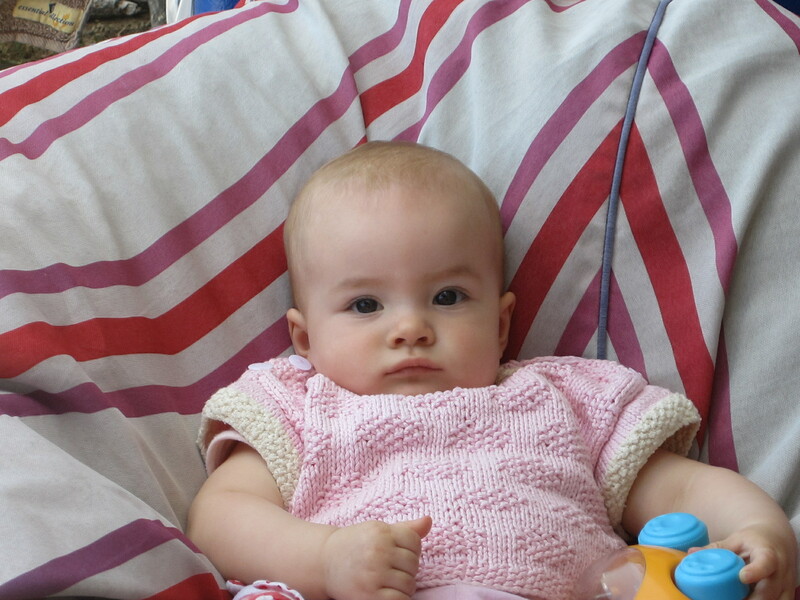 During the summer, I made a little overdress (or tunic) for our baby girl from wool I bought without realising it was 3ply. I was not very excited about the project as I don’t really like knitting with 3ply and I wasn’t very keen on the pattern. 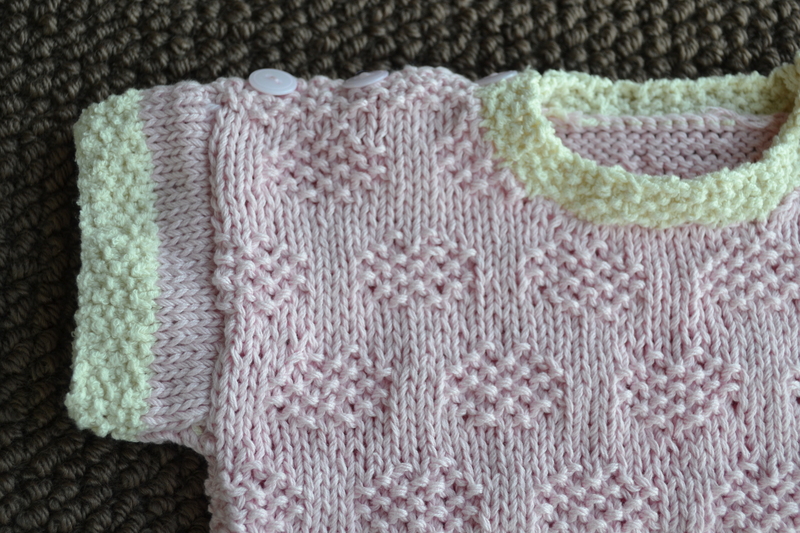 But since I had let my daughter choose the pattern for her baby it didn’t feel right to try to talk her out of it. I am so glad I didn’t talk her out if it. She loved the little overdress and so did one of her friends. Her friend loved it so much that she asked if I would make one for her baby. How can you say no to that? She chose a light grey. So I made another little overdress for another cute little baby girl. I hope she loves wearing it. I made this one in 4ply instead of 3ply because I was worried that the largest size in the pattern would be a bit small. 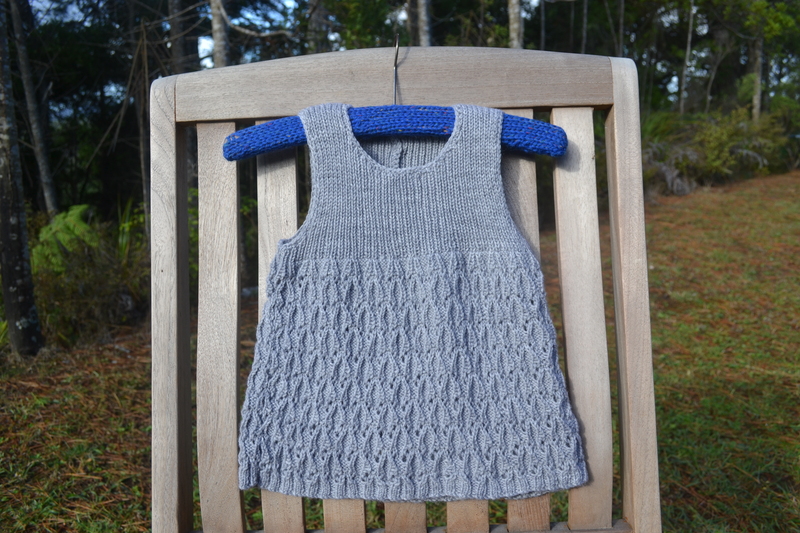 Once knitted and sewn together, this little overdress is given a crochet edge for a neat finish. I did have a few problems with the yarn while knitting this but after a replacement ball of wool, I managed to get this finished. I had two balls of John Q double knit cotton in my stash that I paid very little for. I had no idea what I would do with just two balls, particularly when these balls only had 103 metres in each. Not a lot of yarn to do much with. 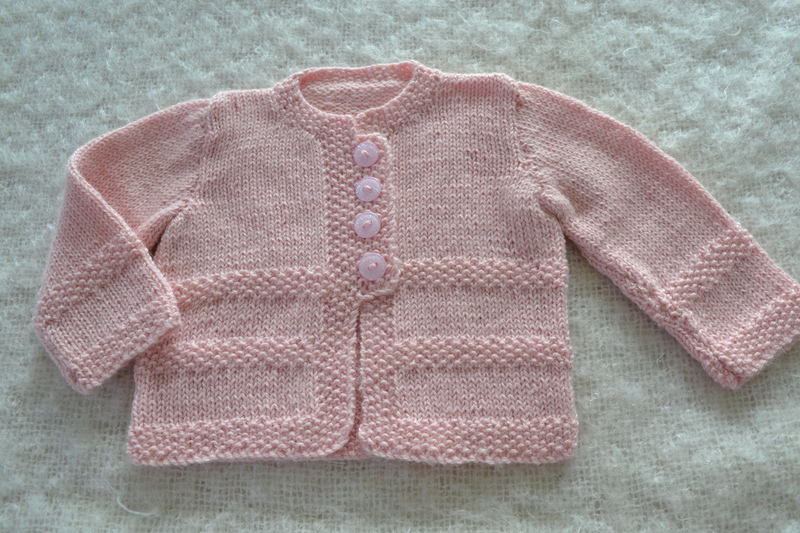 Then I remembered I had made this pink short sleeve cardigan for a friend’s baby and it took such a small amount of yarn, so I thought I would see how far I got making the little sweater from the same pattern. The worst that could happen is that I get most of the way before having to pull it all undone. But I made it. I used a small bit of left over cream cotton for the neck and arm bands and made the sleeves shorter but I did it! I even had to use another yarn to sew it up. But I didn’t mind. At least I didn’t have to pull it all undone. And I love the cream band and the sleeves are a perfect length on a wee baby. UPDATED February 2014 with the wee model wearing the summer top on her beach holiday. 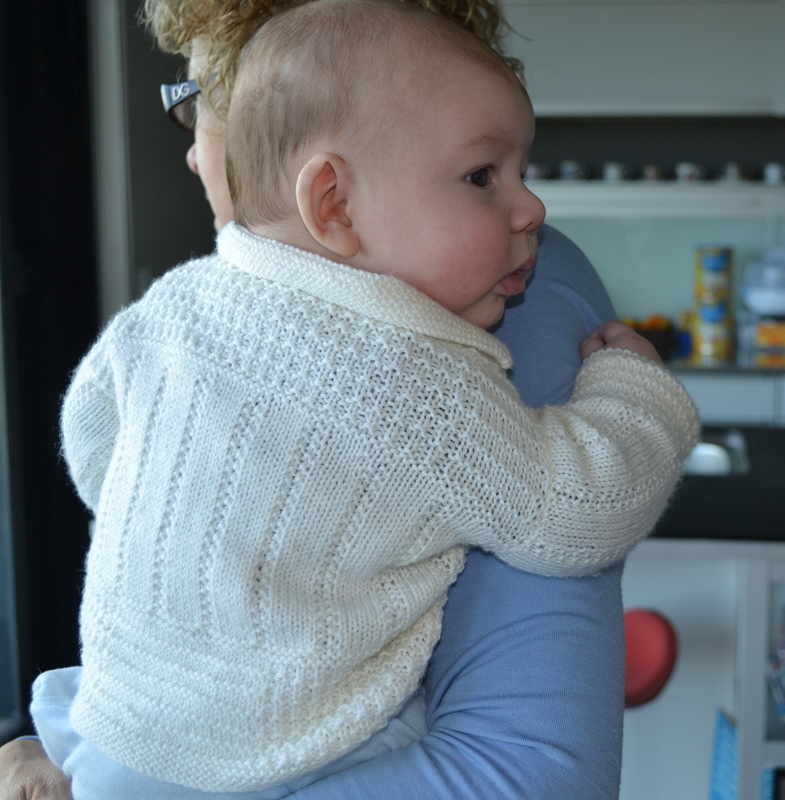 When my daughter was pregnant, we found the Debbie Bliss Baby Cashmerino book in our LYS. And in that book, we found the pattern for the Teddy bear jacket and fell in love with it. Despite the price of the book, off we went home with the book in a bag. This little Teddy Bear jacket will be perfect for my daughter’s baby’s second winter. The recommended wool for the Teddy Bear jacket is Debbie Bliss Baby Cashmerino which is an expensive wool. I looked to see if I could substitute with a slightly less expensive wool but it is 5 ply and therefore less readily available. 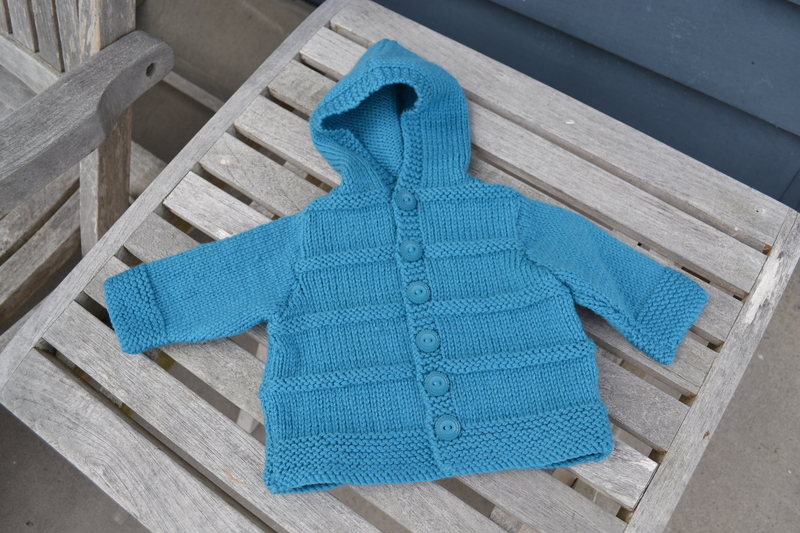 I had read a few Ravelry comments from people who had knitted the Teddy Bear jacket with substituted yarn and they were often disappointed with the size and sometimes shape of the finished object. So I decided I would use the recommended yarn, as this jacket is quite a lot of work and I don’t want it wasted by using the wrong yarn. I have been doing a bit of knitting for my LYS and have been saving my knitting money to use for the Teddy Bear jacket and now I am ready to buy! How exciting. 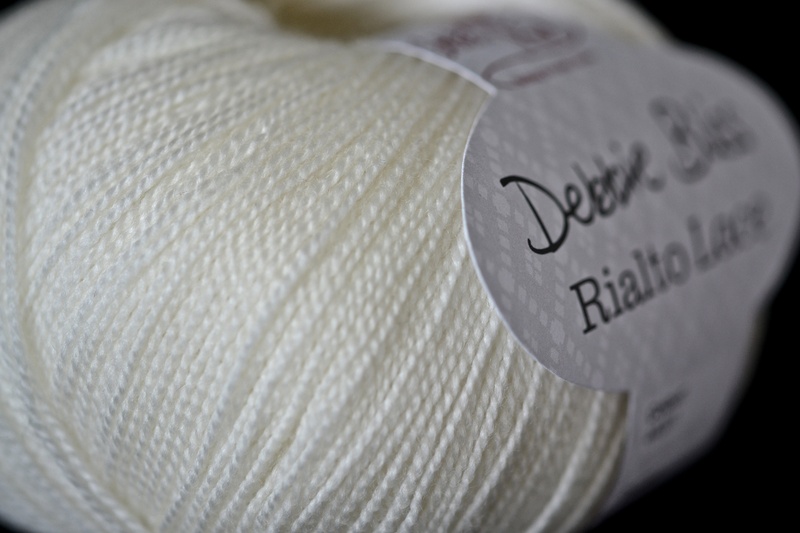 But in the weekend I was doing a bit of Ravelry reading and I happened to stumble across the comments for the Debbie BLiss Baby Cashmerino and found that many people said that the yarn pilled badly. Some even said it was starting to pill even before they had finished knitting their garment! Now what am I going to do? There were just too many comments from people about the pilling, so I am not going to use this yarn. I guess all I can do is to use a double knit or 4 ply yarn and try to get the tension right with a few tension squares. I feel just a tiny bit disappointed as this Teddy Bear jacket has been planned for 12 months already and I want it to be just right. I decided to buy the Debbie Bliss baby cashmerino yarn. I wanted it to be right. I have now finished the jacket and it fits baby perfectly. The yarn definitely did not pill as I was knitting it. It is soft and cuddly and I hope it remains like that after lots of wear and washing. 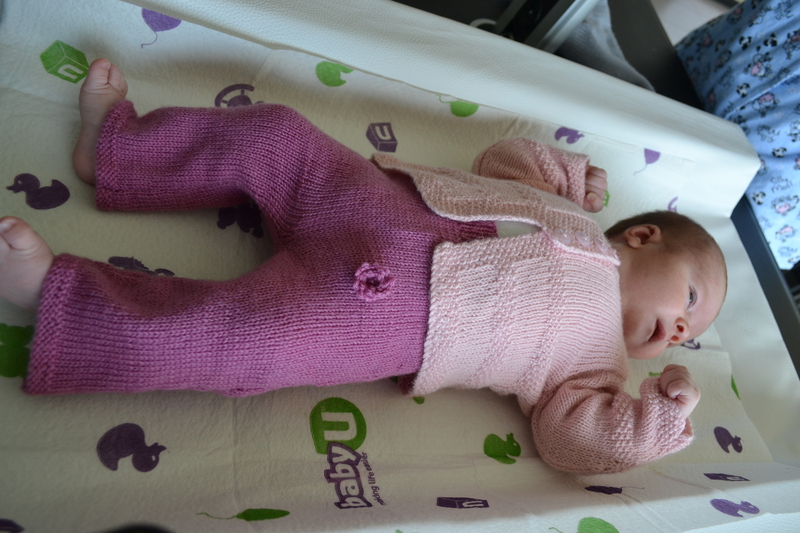 One of my daughters dresses her baby in knitted pants most of the time. 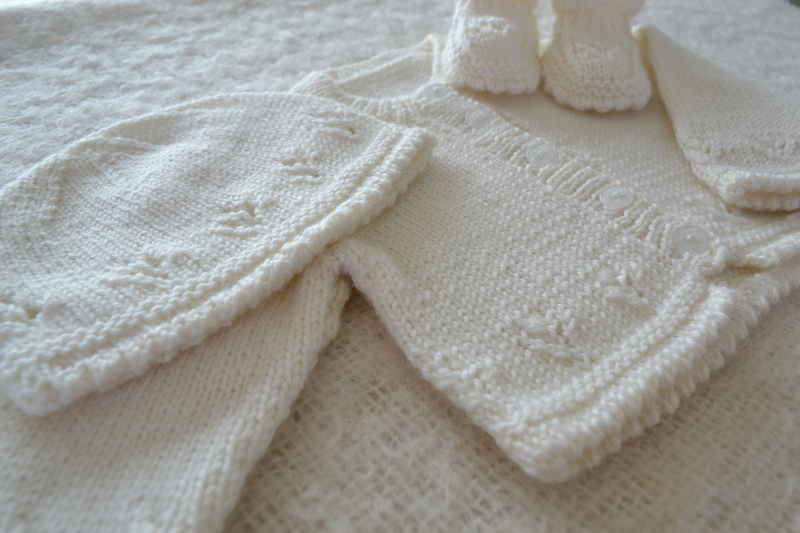 They are easy to negotiate nappy changes on kicking legs, easy to put on, soft to wear, easy to wash (merino baby washable wool) and they look good. For this first daughter, the baby pants of choice is a Panda pattern and I have now made her four pair, grey, blue, pink and white. My other daughter was offered knitted baby pants but she didn’t think she would use them. Until of course, she saw the other daughter’s baby wearing her knitted pants. So daughter number two decided she did want some after all. So we chose a pattern together and some grey gunmetal coloured wool from my stash and this is what we came up with. 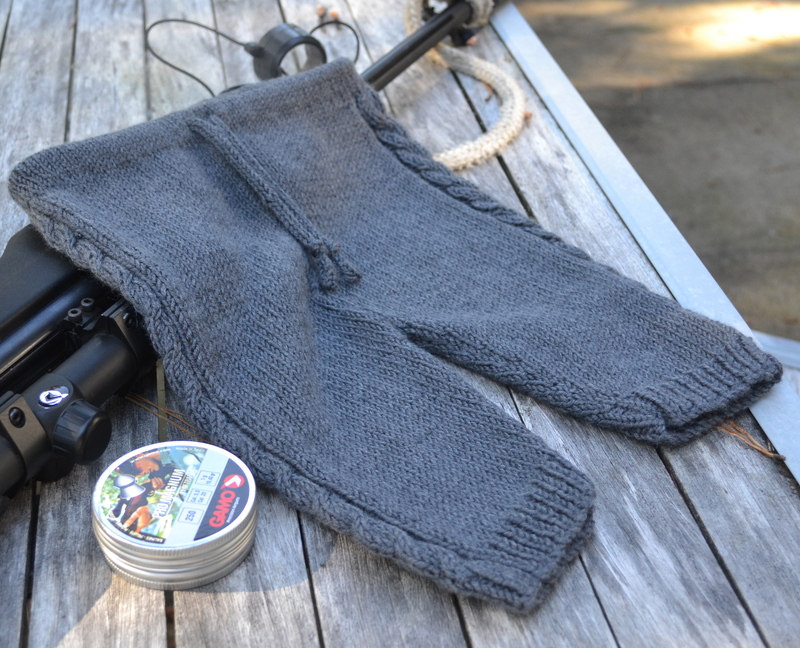 A lovely little manly pair of knitted pants for a five month old baby boy. I used to knit many years ago when my children were small. I used to knit aran jerseys for my dad in the 70’s. I love knitting cables. This is the first cable I have done since picking up my knitting needles again last year. This is the very first i-cord I have ever knitted. How very simple and quick to make. These little pants are knitted in two halves and then joined in the middle before using double pointed needles to do the waist band. 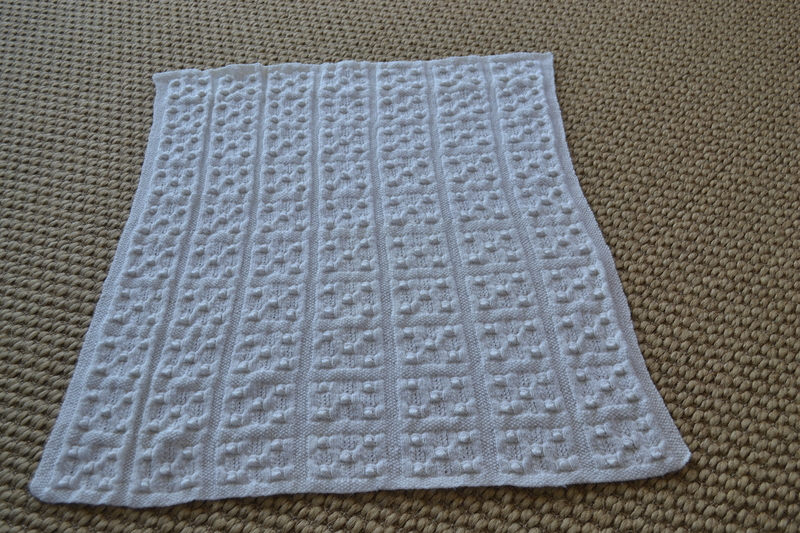 A lot of fun and a very quick knit in double knit. Hopefully they won’t be too hot. It is the first day of spring here in New Zealand. These booties are actually called Roses and Violets and were meant to be pink and mauve. I had no mauve but I did have some green I had left over from the baby bunting I had made to decorate my grandbaby’s cot. I think the green and pink go really nicely together but of course, look nothing like Roses and Violets, so mine are called Watermelon booties. How very, very lucky I am. I wandered into my local yarn store a few days ago. The owner knows I love cute little baby patterns and she had recently got a copy of an old Plunket Society baby singlet pattern. It was so gorgeous and lacy and when she saw me oohing and aahing over the pattern, she gave me a copy (as it does not have a copyright). Look at the strands. Aren’t they just beautiful. Look how fine they are. The owner of the shop happened to mention that she must get one of the Plunket singlets made up for the shop as a sample. I said I would be happy to make one for her. So we made a deal. She gave me the ball of Debbie Bliss Rialto Lace, which should be enough for two singlets. She pays her knitters in the equivalent of yarn but if the pattern is intricate, then there is some negotiation. I wasn’t expecting payment in any way when I offered but I was more than happy with outcome. Now all I have to do it knit up these beautiful singlets. Oh dear, the singlet has a crochet edge. Can I remember how to crochet? This is the second little hoody that I have now knitted. The first one was this little pink one which I really loved. When I was in the local yarn store looking for buttons for the pink hoody, I happened to look down and saw this beautiful coloured teal wool just sitting there waiting to come home with me. 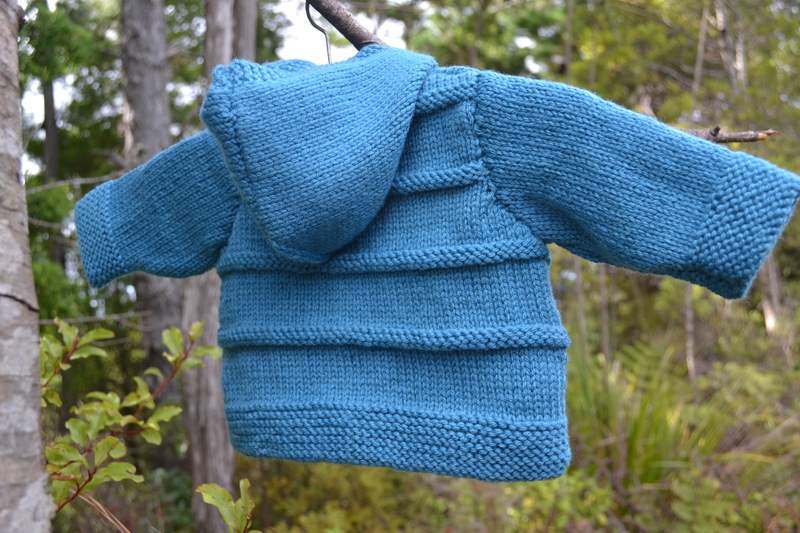 I hadn’t planned on making a hoody for my baby grandson who is due in a few weeks but when I saw this wool, it seemed to scream out for a gorgeous little manly hoody. But there were only four balls left in the shop. For the pink hoody, I had gone into the fifth ball to complete the banding. So I asked the shop owner if she knew of any hoody patterns that might only use four balls and she went straight to this one. The pattern is for Twilleys freedom sincere cotton, which is also a double knit and it uses only three balls. The meterage of the cotton and the Patons Dreamtime wool was about the same, so I should be fine with the four balls. And I was. I just went into the fourth ball, even with making the jacket slightly longer than the pattern said. The hood on this pattern was made quite differently to the pink hood I made previously. This one you increase and then decrease at the back of the head to get the hood shaping and then joined it with one seam down the centre. The pink hood was knitted in one piece with no shaping and then you cast off on both edges of the hood and continue knitting on the centre stitches. That way you end up with two joins at the top of the hood. I’m not sure which I prefer. I enjoyed knitting them both. I guess I will see which sits on the babies head better once they are born and dressed in their hoodies on a cold winters day. And once again, I was worried that I might not find the perfect buttons, but I did. It took visits to two different shops before I found them. I bought these in Spotlight in Albany and the colour couldn’t have been better. Updated to include a picture of the wee baby boy wearing it. He is six weeks old and just fits it but he is a big boy. There were two boys due to be born this year in our family, or so we thought. But then my daughter had her 20 week scan and her baby is a girl. 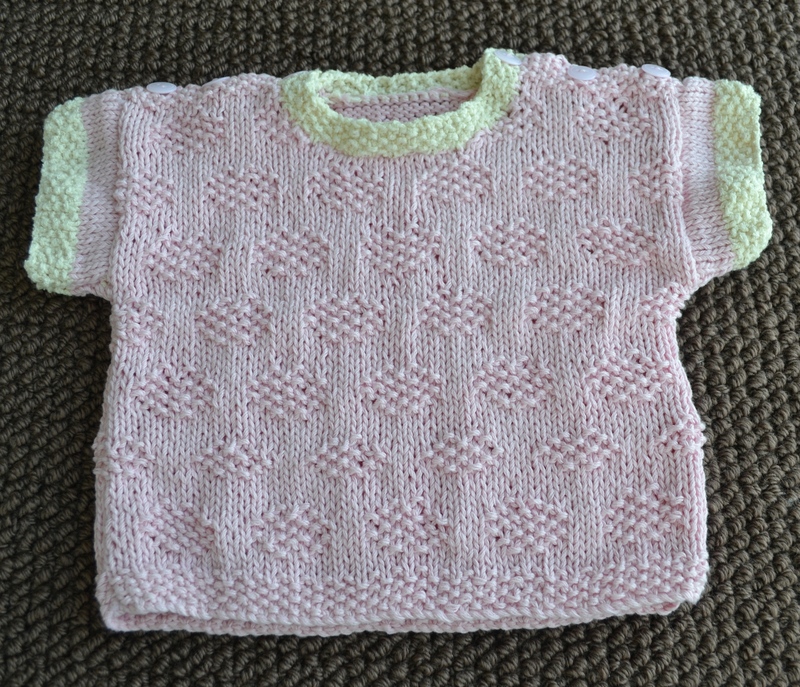 We hadn’t even thought about knitting for girls so we weren’t very prepared with pretty newborn girl’s patterns. So we started searching. When I started knitting again after many years, I noticed my daughter watching how it was done. She asked me one day if I thought she could do it. Of course she could. So for Christmas I bought her a pattern book for a simple little baby singlet with a heart motif and some alpaca baby yarn. 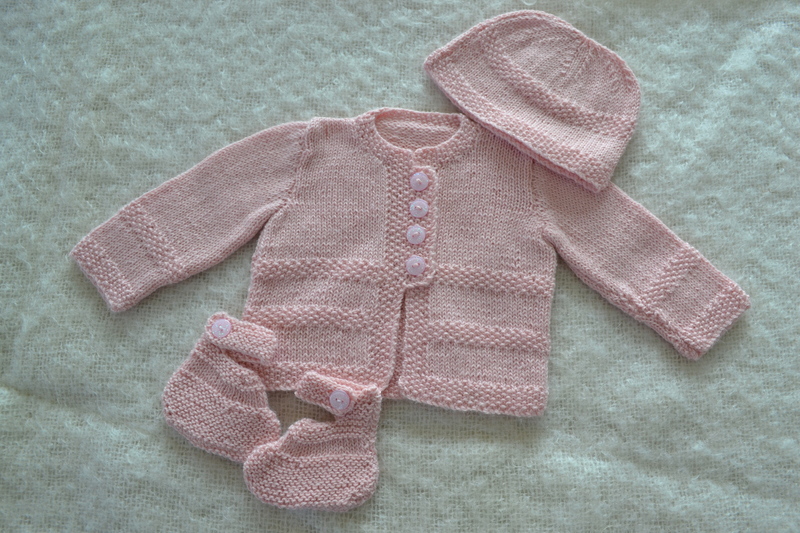 And in that same book, there was the pattern for this gorgeous little cardigan, booties and hat. So I went out and bought enough of the pretty pink in the baby alpaca yarn to make the set. I must say that this is some of the nicest yarn I have ever knitted with. I will definitely be buying more of it. The pattern book is a Filatura di Crosa using Super Cashmere(100% cashmere) but I bought 100% alpaca based on advise from the owner of the Crafty Knitwit store and the price of the yarn, which was about half the price of the cashmere. 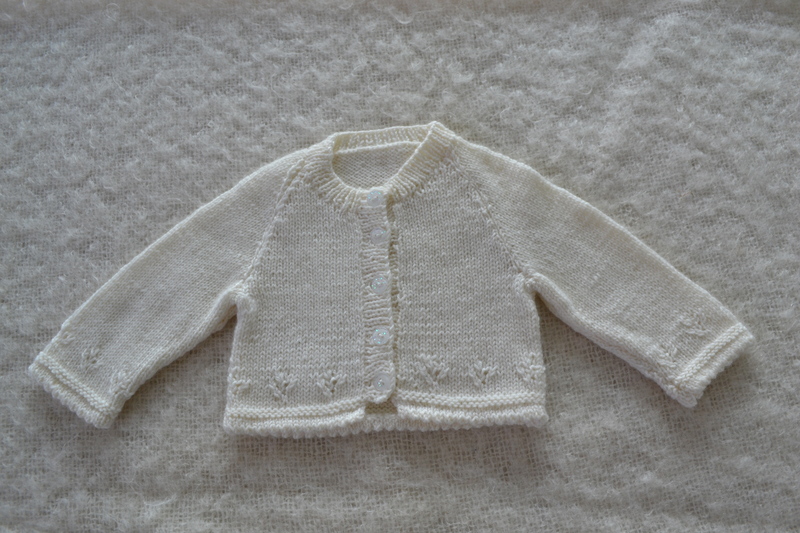 The cardigan turned out a little bigger than some of the other newborn cardigans I have made but only by a couple of centimetres so it should fit her from birth through to the end of winter. 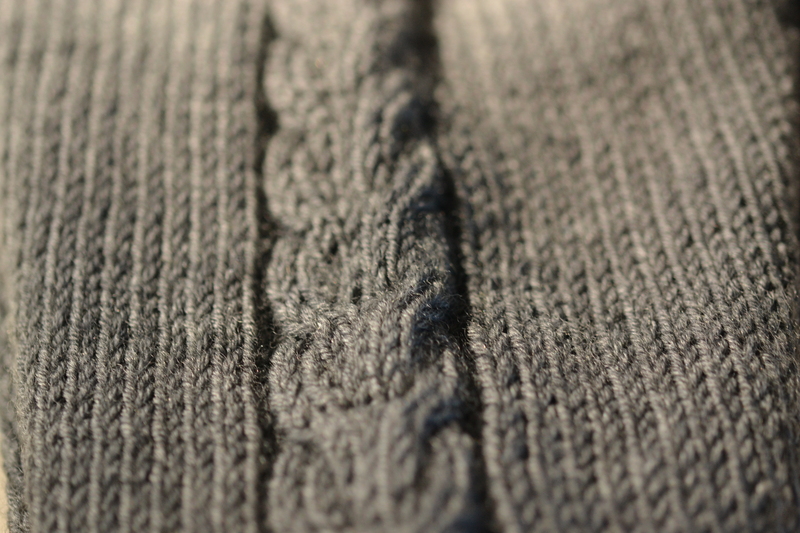 I love the simple moss stitch detail of this pattern and the little buttonhole band adds to the overall design. 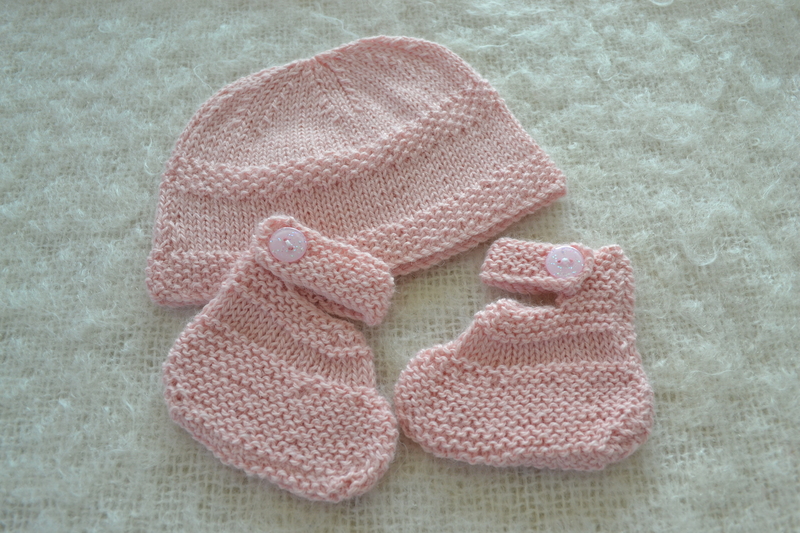 The little hat and booties were so quick to make. 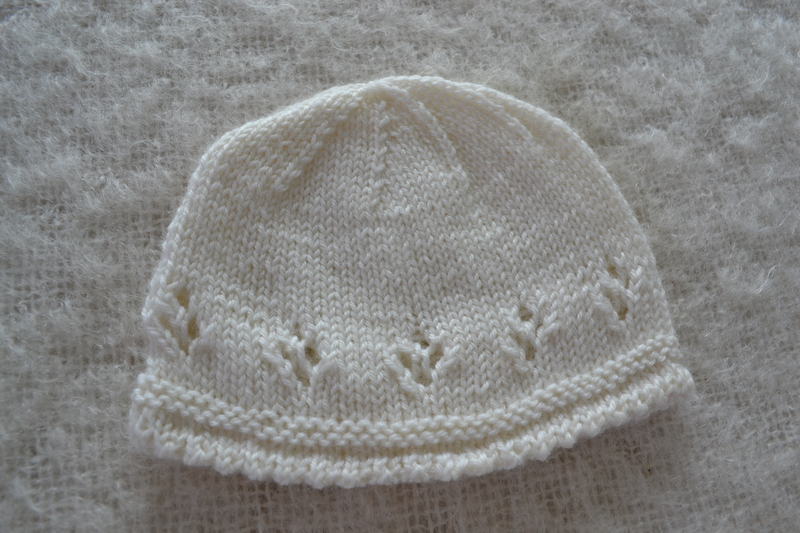 The hat is a lovely size for a tiny newborn head, so hope the baby is born a “normal” size baby. But it is so quick to make that I could do another one in an evening if this doesn’t fit. 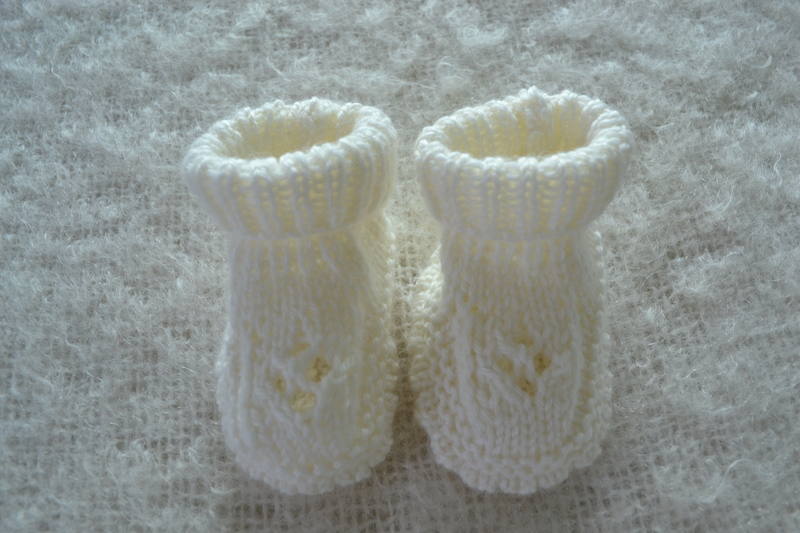 The booties were the simplest booties I have ever made. No turning for the traditional instep. Just lots of decreasing of stitches. 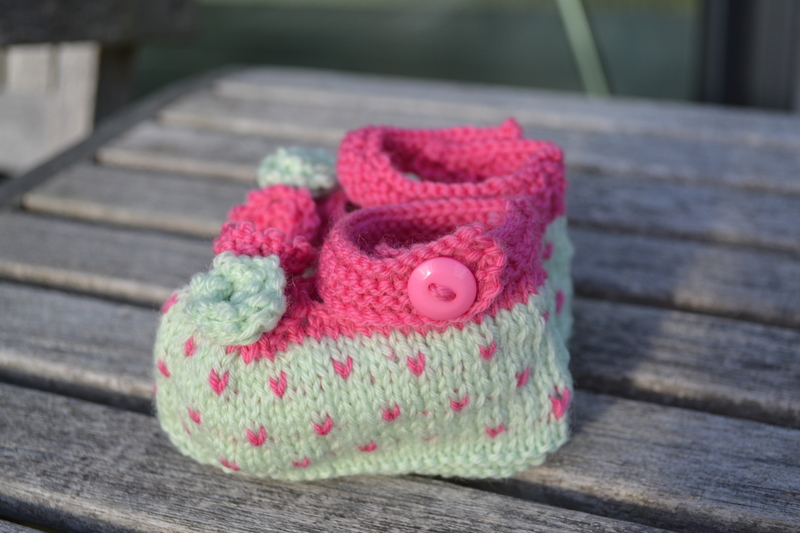 I am going to get my daughter to make these booties to match her little singlet once it is finished, as they are so quick and easy. Her little singlet is in a gorgeous fawn / brown colour. UPDATED July 2013. Fits baby perfectly at four weeks old. She was 7 1/2 lb born. 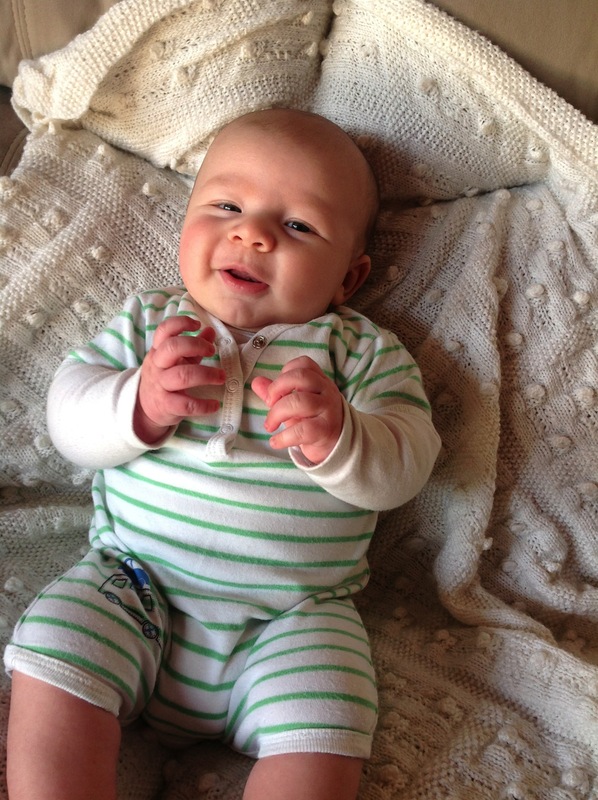 UPDATED August 2013 with photo of booties being worn at 8 weeks. They are a great “stay on” booties, even with lots of happy kicks while talking to uncle. UPDATED Sept 2013 to show the cardigan still fits at 3 months. 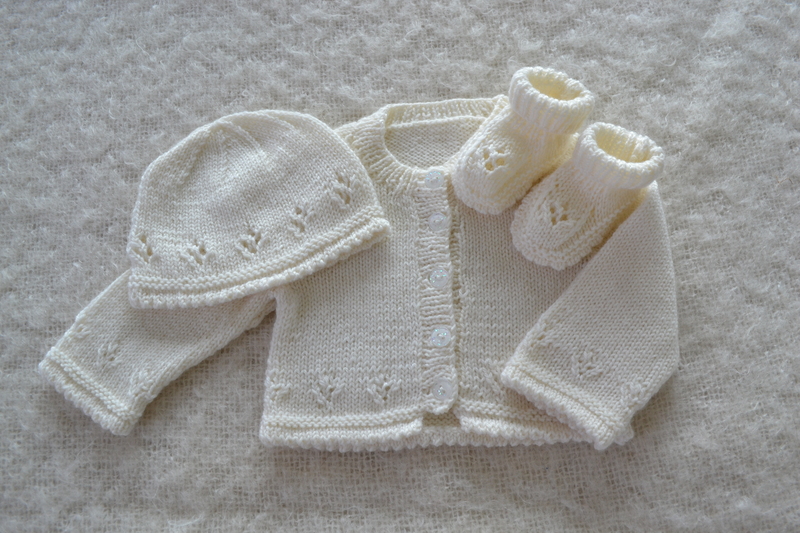 White Patons Jessica Picot Edge baby cardigan, hat and booties. 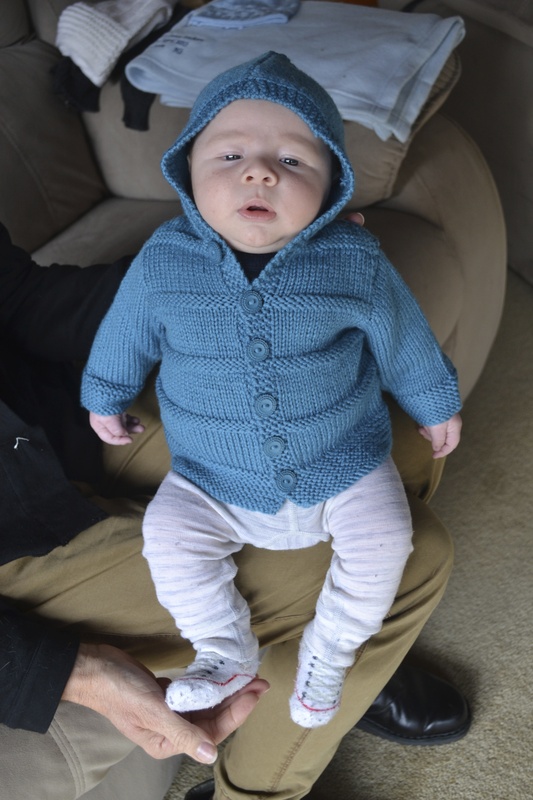 This is a little 4 ply cardigan, hat and booties with a picot edge made in 4ply merino baby wool. It was very quick and easy to knit. Even the sewing was quick, despite the picot edges needing to be folded and slip stitched but I didn’t mind. 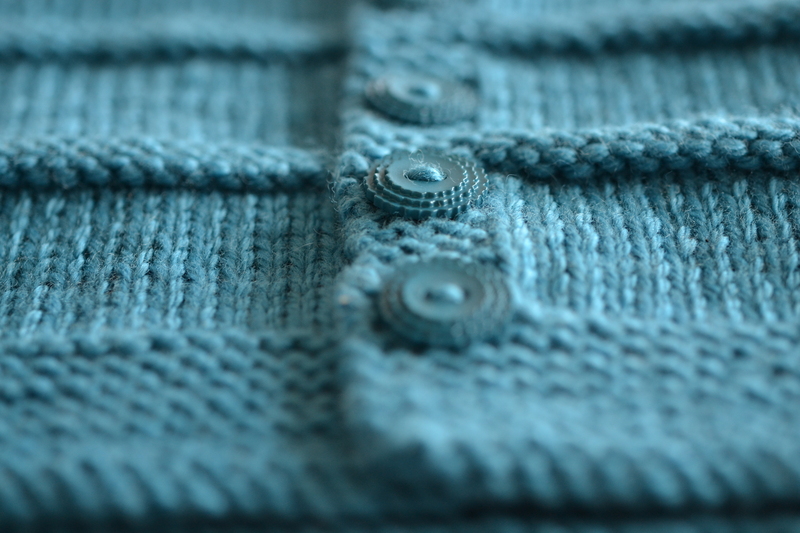 I actually like sewing up knitted garments. Most people seem to despise the sewing up. So much so that I know people who have a knitted bits and pieces that have been sitting for a number of years waiting to be sewn. What a waste of all that beautiful knitting. To me the sewing up is a bit like the final tribute to all that hard work you have put in, seeing it slowly turn into the finished object. 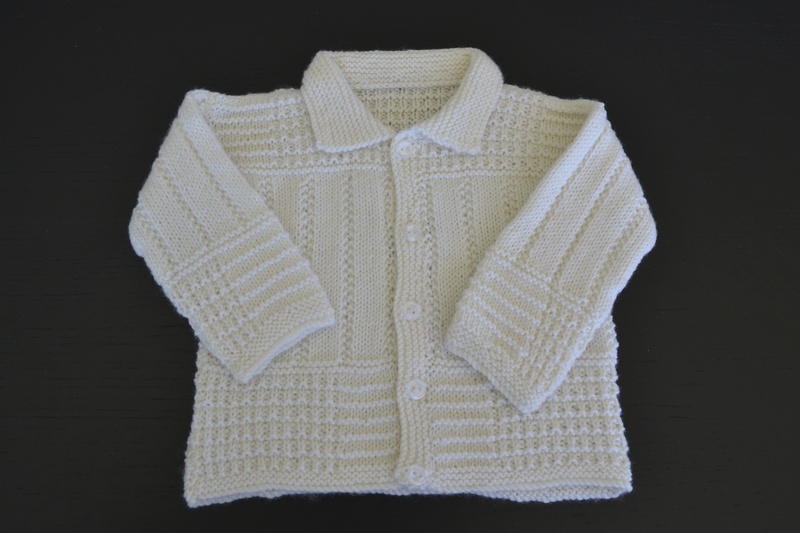 The cardigan is newborn size and took two 50g balls of Shepherds baby merino 4ply wool. The wool is very soft and beautiful to knit with. Although I was a bit disappointed when I used the same wool to sew my baby shawl as there were knots in the balls of wool and that annoys me. This shouldn’t happen at over $10 NZ per ball (over 5 British pounds). 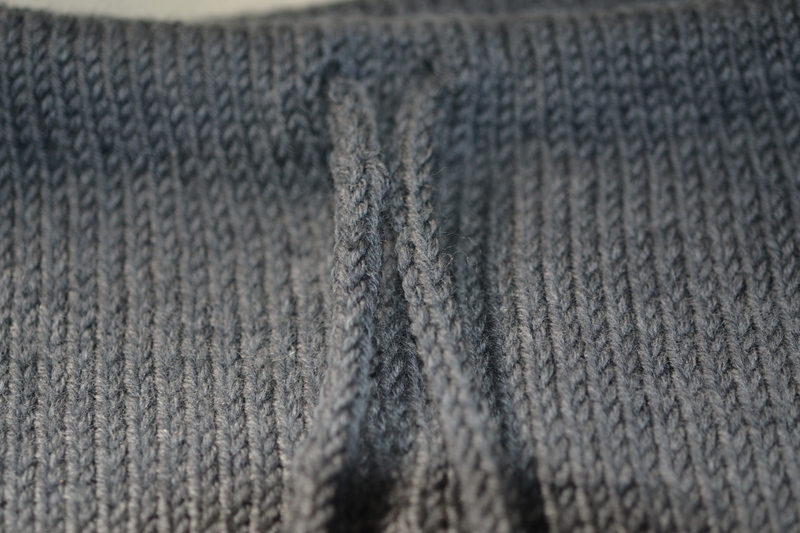 The picot edge is knitted and then folding during the making up by slip stitching the little hem. Very easy and effective. The hat is a little cutie. The newborn size looks a perfect size for a newborn. The baby this is made for is due in June (the middle of the New Zealand winter) so I hope she is a “normal” newborn size if there is such a thing. It should fit her for a couple of months, (maybe). Never mind if it doesn’t, I can quickly make another one. It only used about half of a 50g ball. The picot edge on this hat was made the same way as the cardigan. These very, very cute booties almost did not get made. In fact the whole set almost didn’t get made. I had attempted another pair of picot edge booties a month or so earlier and they were so difficult to make, I gave up. The picot edge was done (the same as these booties) by picking up a stitch of a previous row (about 4 rows prior to the one you are knitting) and in the first pair of booties I attempted, there was no differentiation between the rows so it was impossible to pick up hte right stitch. 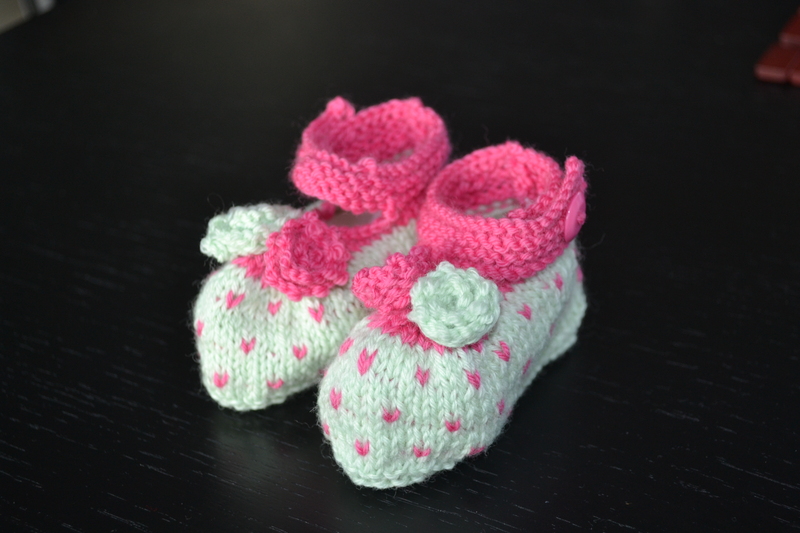 I ended up pulling those booties off the needles after many attempts and sore fingers. I didn’t want to make this little picot edge set as I had horror thoughts of those previous booties but my daughter had fallen in love with this little Patons “Jessica” pattern so I had no choice but to try. These little picot booties were easy. (Well not easy but definitely doable.) The row that you had to pick up from was easy to see as it was the first of the stocking stitch rows after garter stitch, so easy to differentiate. 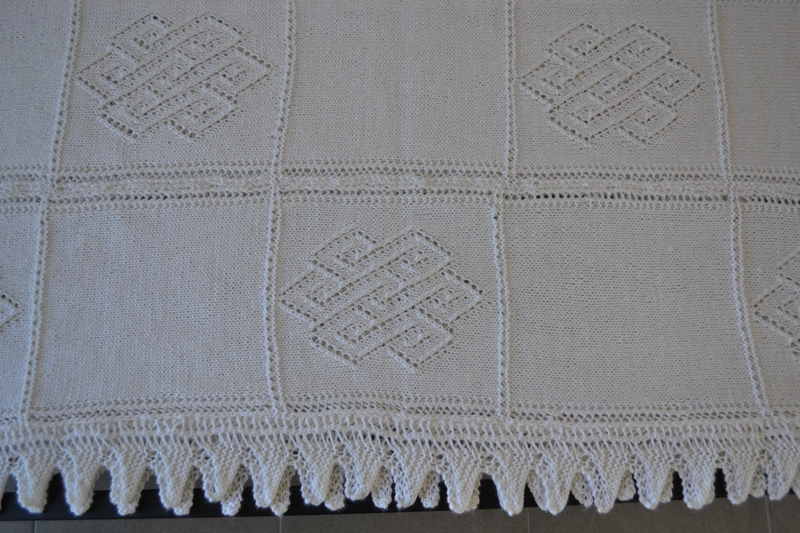 I’m glad my daughter insisted on this picot edge set, as I love the way it has turned out. UPDATED June 2013 with a link to the little pants I made to match this set. I haven’t knitted since my children were little and now my daughter is expecting her first baby. 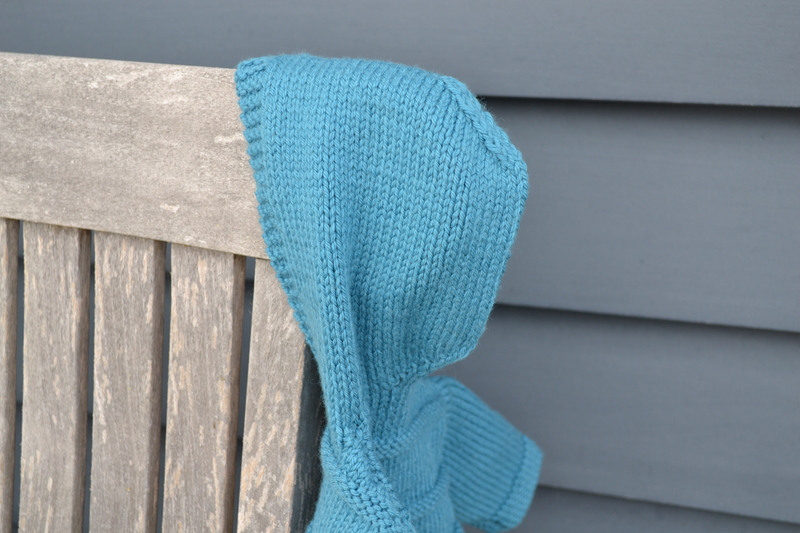 Wouldn’t it be nice to be able to knit her a beautiful shawl for her baby. But can I still do it? Can I remember how to cast on? What a huge project for my very first knitting foray after twenty years. But it can’t be that hard can it? So one lunchtime I went to the local wool store and spent an hour or so looking through all of the patterns. I couldn’t believe that some of the same patterns I had knitted all those years ago were still available today. Perhaps I shouldn’t have thrown all my patterns and needles out. I am the opposite of a hoarder and sometimes to my detriment. I finally chose a pattern from the Sirdar Early Arrivals book. I guess I was quite surprised at the limited number of baby shawl patterns t0 choose from but that may have been a reflection on the store and not on shawl patterns in general. This pattern was quite a nightmare to make. For a start I had forgotten how to cast on! But a quick search online reminded me and I was on my way knitting the first panel. The pattern is done in 4 ply and I chose Shepherds baby merino wool. This yarn is very soft and will drape beautifully around this newborn baby girl when she is taken out in the New Zealand winter months. The lace panels were not easy to follow and it took me most of the first three panels to be able to “read the pattern”. It is quite complicated and you certainly can’t watch your favourite television program while you are knitting the lace. There are two particular rows that seemed to be my nemesis. Rows 27 and 29. I had to smile when I read a comment on the Ravelry knitting site by someone else who had knitted this shawl and had the same problems with the same row. I think there are ten lace panels and with the amount of unravelling I had to do, I think I must have knitted about fourteen of those panels! I thought the lace edging was going to take forever but it didn’t actually take too long. Getting the lace edging the right length was not the easiest. Even though I calculated the length I needed and then casted off when I thought it was long enough, it wasn’t long enough. I had to undo the casting off, stitch what I had so far onto the shawl and then finish knitting the last little bit until I got it just the right size. Even though this was complicated, I love the finished object and I am very happy that I chose this pattern. I don’t think I would do it again. But then again, never say never. My husband asked me if I would make another one the same for his daughter who is also pregnant but I chose her baby a different pattern and I love it just the same but it was a lot easier to knit. 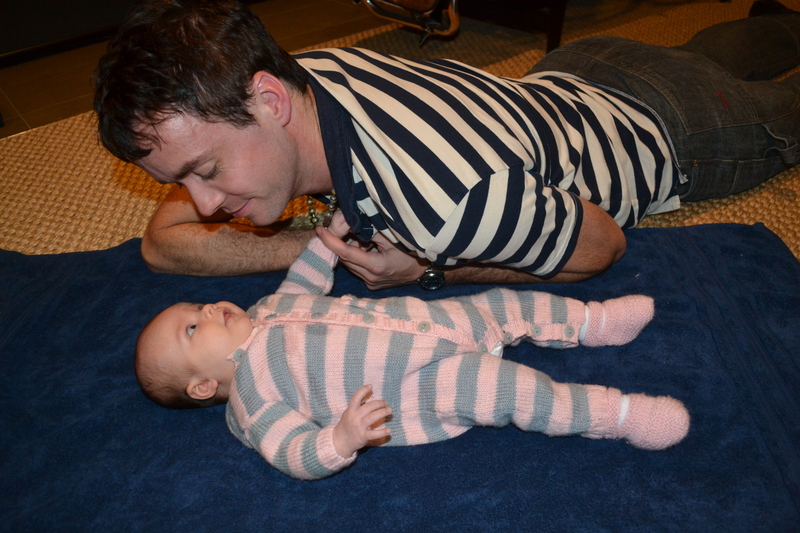 UPDATED July 2103 with photos of baby and shawl. 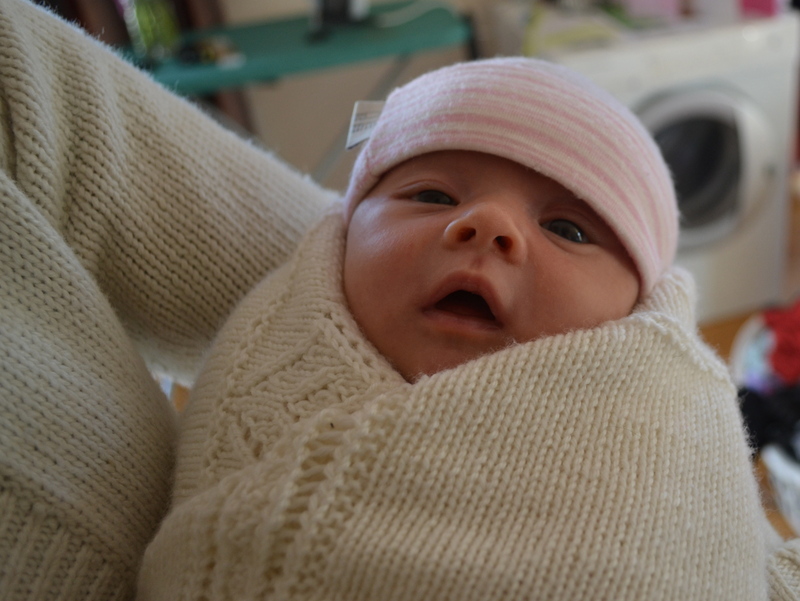 Baby was wrapped in the shawl soon after birth. Nice and snuggly wrapped for a winter walk. This little girl is now 3 and her shawl has now become a blanket for her bed. 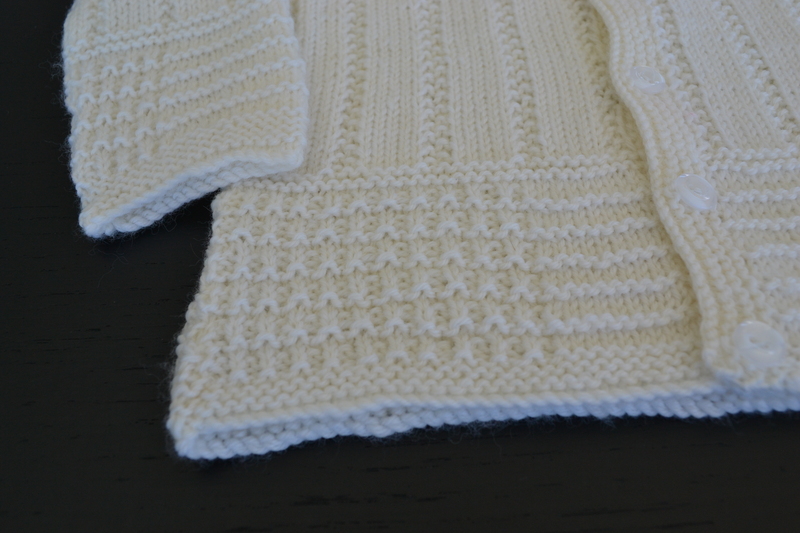 Details below of the baby shawl in this post. These cute little baby sandals are quite fiddly to make but they are so cute. The fiddly part is the edging of the little bar that the strap goes through. 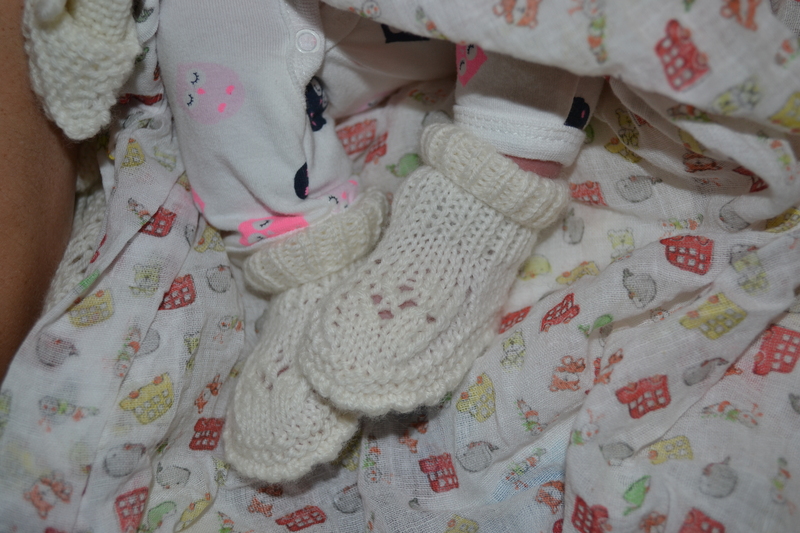 These booties are so cute that I will definitely be making them again Never mind the fiddliness. They are still very quick to make. 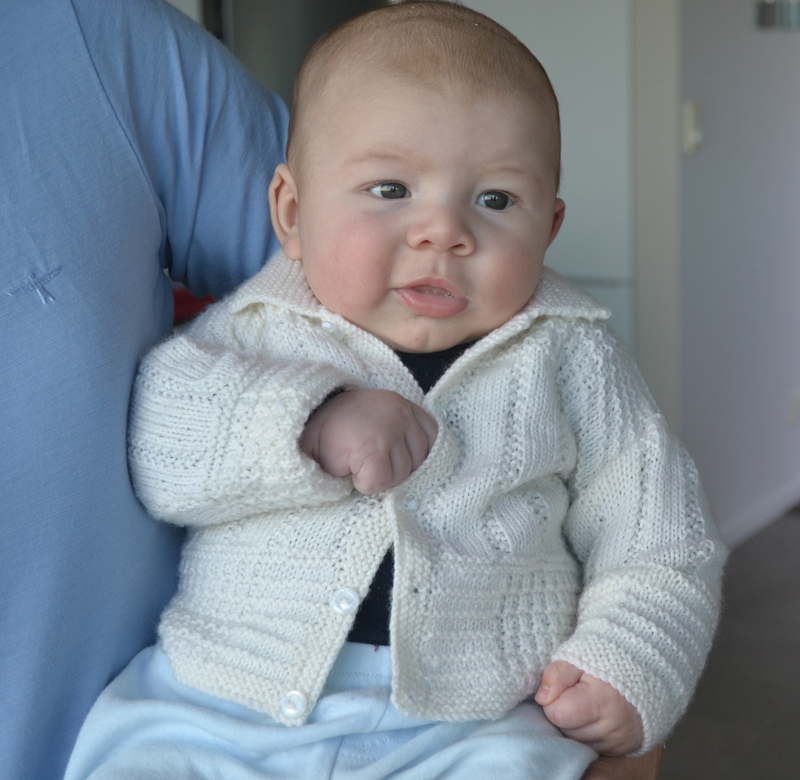 I love this manly little baby’s cardigan. 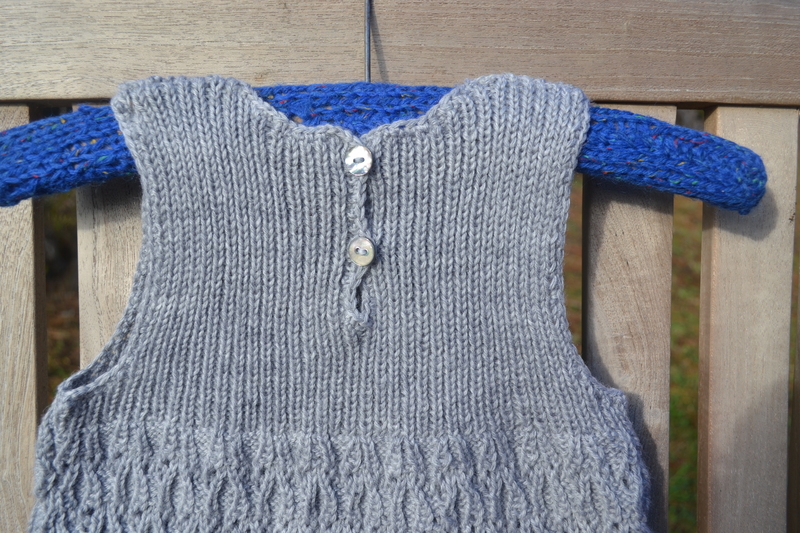 It is a simple and quick little pattern to knit but very effective. Memphis is 3 months old and this fits him perfectly. The size I made said it was for 0 to 3 months so this little cardigan pattern is quite generous, especially since this baby is a big baby. He was born 9lb. Unfortunately his Dad thinks this cardigan is a bit too feminine. Perhaps it is but it was a boy’s pattern! This shawl was made for my husband’s daughter’s first baby. 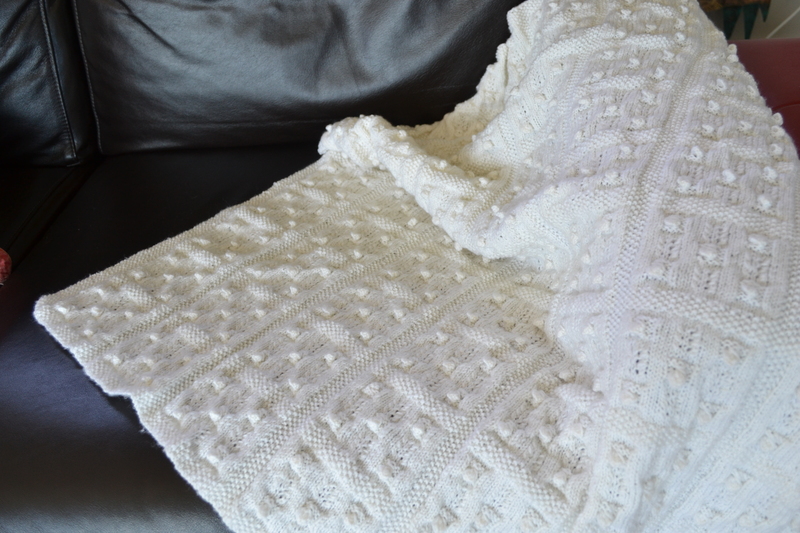 The pattern was adapted from a blanket pattern which used aran wool. 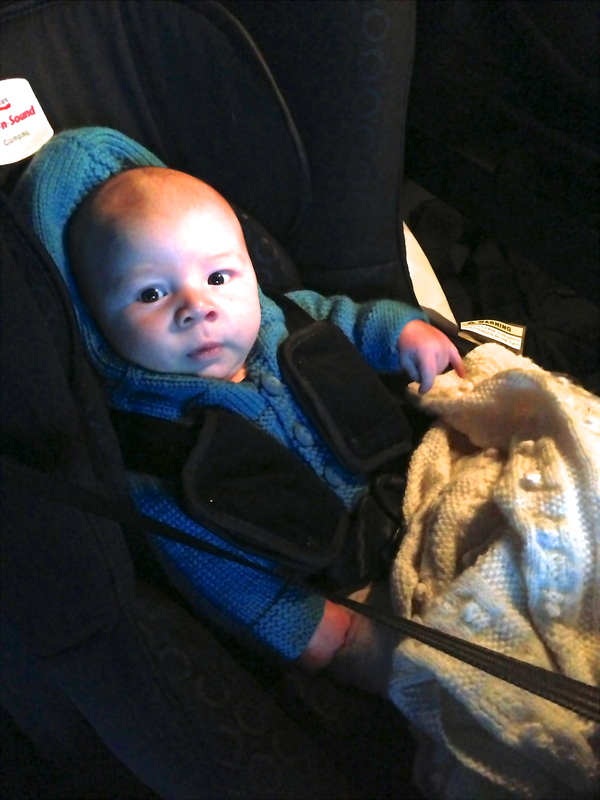 I wanted a soft baby shawl so the new baby can be wrapped up and cuddled on his first outings. I am very happy with the way this shawl came out. I would definitely make this again as the pattern was quite quick to “read” which meant less focus was required. I just wanted to say that my step daughter wasn’t really sure when I made her this shawl, what she would do with it (first baby). Now that her baby is 3 weeks old, this shawl is never far from baby. It is used as a blanket on the bassinet, a car seat blanket, a breast feeding cover and a warm cover when he is being cuddled or winded when it is cold. 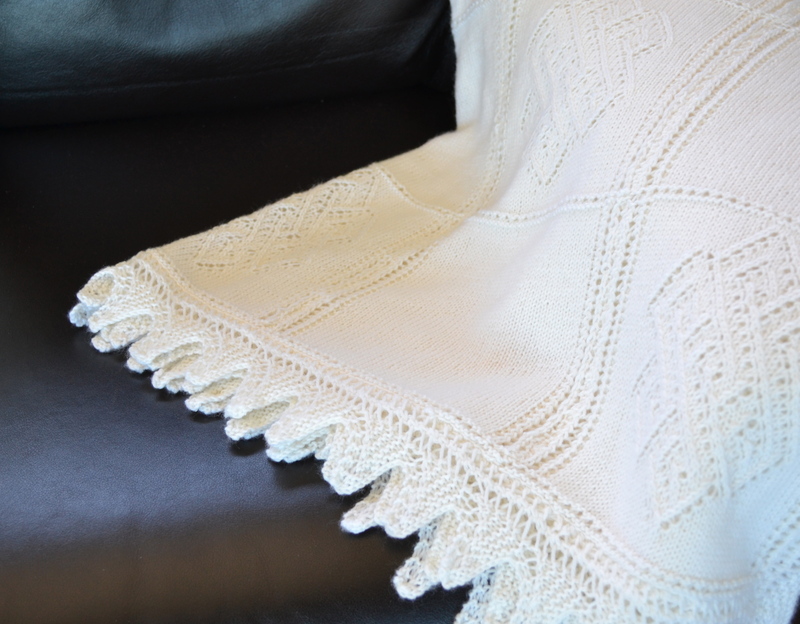 The shawl is soft enough and light enough to be used for any purpose and is able to “scrunch up” quite small. UPDATED June 2013 to show photos of baby and shawl. 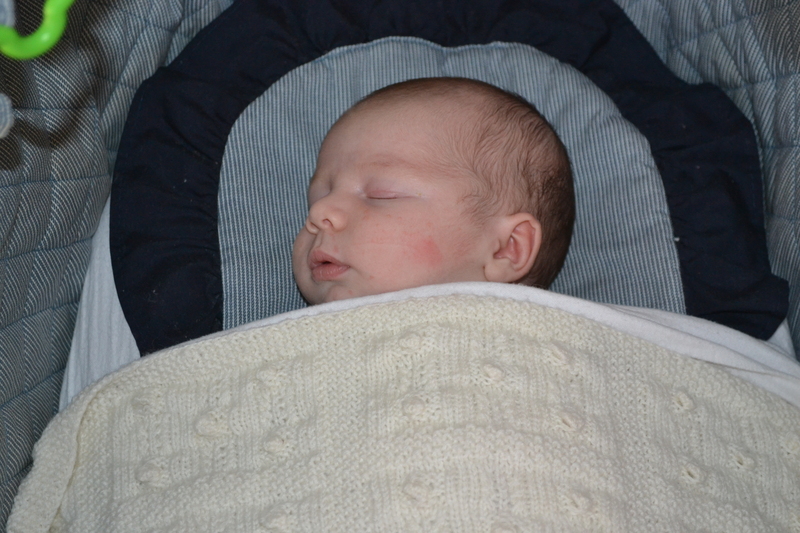 A blanket in his bassinet. Something nice and soft to play on. It even goes in the car. Pattern – Free online pattern which is now unavailable.